April Theme Day for the City Daily Photo Community. Visit other participating sites. Love the lines and angles you've caught at this very angular spot. Great Boston corner and theme shot! 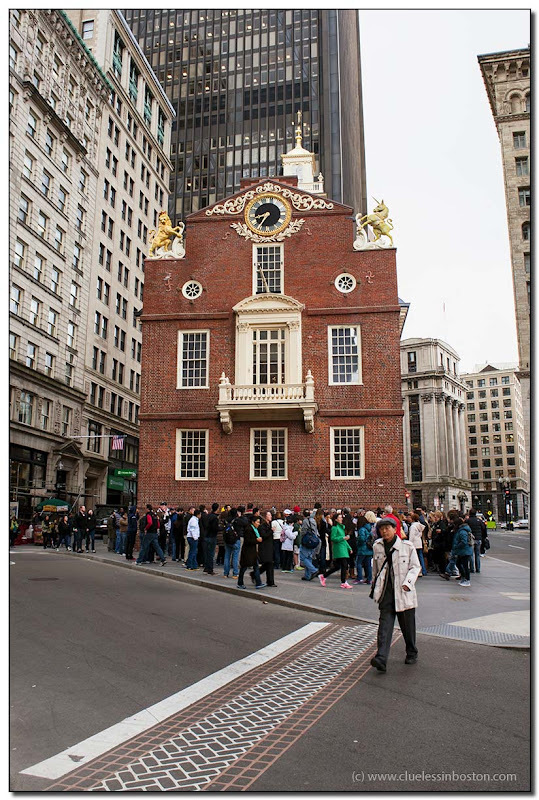 It looks like one pedestrian is crossing and the rest are standing in line to get into an historic building. Cool brick work on that crossing. Super theme day choice. Nice play on words; I remember oing in the Hall on our visit there about three years back. Looks as though it has been surrounded by Japanese tourists instead of Bitih Redcoats. Last post should have said "British"; I blame the iPad keyboard. SO ... why is there just one pedestrian? What do the other people know that he doesn't?!?!?! Great shot!! great shot, so much to see, so many angles! and lol at red! He's walking briskly away from the crowd... like I probably would too! Where's the colored umbrella to lead the way? Wow. Lots of angels and lines here. Very good. Great stencilling on the road. Quite a story here; wish I spoke Japanese! Marvelous realisation of the theme to contrast the tourists waiting to get in against the solitary walker.